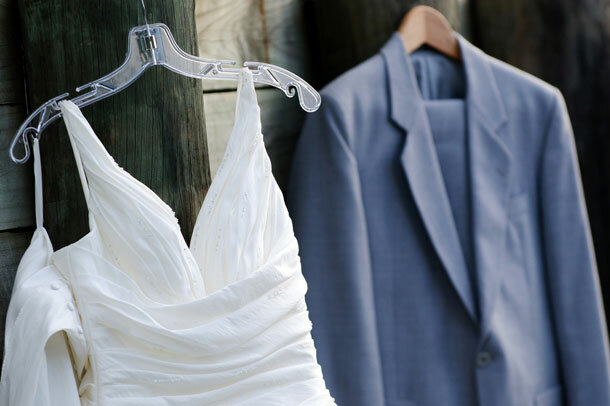 You are here \ South Africa Weddings \ Tie The Knot \ Wedding Tips & Advice \ Can I Tell Guests What To Wear At My Wedding? Before we say ‘yes’ to this question, it’s a good idea to qualify what type of ‘dress’ we’re talking about. If you have an urge for all your guests to attend wearing black and white because you’ve lost perspective and now have an urge that borders on fetishism, forget it. No-one likes being coerced into wearing a ‘uniform’, particularly to a wedding. But giving guests an idea as to how formal or informal the wedding is, is important. If you’ve chosen a wedding at a different kind of venue that requires a definite kind of attire (for instance there’s a swimming pool at your low-key, lunch time venue, or it’s a ballroom requiring splendid gowns) then, despite the fact that just about every wedding forum is going to tell you that it’s against wedding etiquette, letting your friends and family know not to pitch wearing clothes that will leave them feeling terribly uncomfortable seems only fair, in my mind. How do you do this in a way that’s acceptable?